We always strive to satisfy our customers by offering the best prices and product selection as well as providing fast, friendly service. But don't just take it from us, read what our customers have to say! "Just a quick note to say your site will be my first and best source going forward after the customer service I received from Katie. I had a cutting board split shortly after receiving and constant oil. Katie responded in less that 24 hours and had a replacement send out immediately." "Hi Arlene, My name is Robert Dana, and I just wanted to take a moment of your time to let you know that you have an OUTSTANDING employee working for you: Danita Hall! She took the time to attempt to contact me to confirm the correct shipping address for my new Wells Sink, since she had been given two different addresses. But, unfortunately, I was not home last Friday and so it was not until this Monday that I was able to get back to her and express my disappointment that the item had not already been shipped since I was under a time-crunch. She explained what had happened and that she would do everything in her power to expedite the shipment, and she was good as her word! And so, I not only appreciate her follow-through in making sure that the sink was shipped to the correct address, but I also appreciate how quickly she expedited the shipment to help me meet an important deadline! The sink is not here yet, but I have been tracking it through the link you kindly provided and it is due to arrive tomorrow! Danita has served your company VERY well, Arlene, and she just ensured that I will become a life-long customer of Kitchensource.com, AND that I will be sure to recommend your fine company to all of my friends and acquaintances! Thank you once again, Danita! You Rock! :-)"
"Thank you, the cutting board just arrived and it is absolutely perfect… Beautiful craftsmanship!" "hello, I am writing this letter to commend one of your customer service employees, Ms. Jessica Erzen....I ordered on line a very expensive medicine cabinet which arrived in broken pieces, freaked as I was, Jessica calmed me down and took care of everything for me , what a gem she is... this matter went on for some time but she never lost her patience or her positive attitude, I could always hear her smiling... please praise, promote or offer her a big raise she well deserves it. thank you. " "Hello, I received my order. It was a lot earlier than I thought I would get it. What a nice surprise. AND they fit beautifully and are exactly what I wanted. I will be recommending you to everyone. Thanks for a great product. " "I want to let you know that I love the three tiered TV Stand that I bought for my kitchen. My handman put it together and I am as happy as can be. It arrived well packed and there were no damages. Actually perfect. So, thank you!" I just wanted to thank Jessica for all that she has done to help me get the part on my bench replaced. I first ordered this bench on Dec. 29. I then learned it was out of stock but I was willing to wait. This was the bench I have been looking for! Then, I did receive it finally in May, and one of the pieces was cracked. I wrote Jessica back hoping for the best. Of course, the piece was not in stock but they would send it when it became available if I was willing to wait. I am happy to say, I now have my new part and my beautiful bench is all assembled and I couldn't be happier. Thank you, Jessica, for always staying in touch with me and for helping me get my dream bench. Your help was much appreciated! " "Speaker stands arrived today.Took awhile to get here but they were well worth the wait.Husband says that they are the nicest stands he has ever seen.I agree.Very good quality.Thank you." "I can not begin to tell you what a pleasure it is to be doing business with you." "Thank you so much for the excellent service. I will certainly recommand friends and family to work with Kitchensource.com. " "Thank you for being so helpful and professional in your handling of this matter. " "Thanks - I placed my order. I'm hoping it's a lovely piece and I'm satisfied. If I am, I will be referring! You've been very professional thus far and I do appreciated your answering all of my questions expeditiously." "I just wanted to tell you how please I was with your service. As you can see, I ordered the item Wed. afternoon and it arrived on Saturday. The item is just as described, and I am very happy with your service. Thank you very much. " "Thank you for prompt service, I received my order on Friday 28Th and installed it next day. My wife loves it I hope she can get long service from it. .....Love and Peace"
"Arrived as promised, as advertised, excellent product." Tom on the Hafele Full Extension Television Swivel "HA-423.93.310"
"I want to thank you so much for the help Stephanie has been to me. My medicine cabinet was broken when I received it; the 2nd one was sent to the wrong address, and I finally received the 3rd one in perfect condition. Stephanie was extremely courteous and helpful through the entire frustrating process. She is the reason I continue to do business with kitchen Source. In fact, my side lights arrived cracked and she is helping me to resolve the matter. She is also helping me to find out when my cabinet pulls will be sent. You are fortunate to have such a good liaison with your customers." "Good afternoon, i just had to write and say what a pleasure it was doing business with you and the company. the transaction very accurate and professional and we are also very happy with the quality of the product. thank you again for a great performance." company preference on all relevant purchases." "If you have an employee reward program, I would like to nominate Ms Pagan." "My purchase from your concern was very satisfactory. My merchandise was shipped quickly and securely. Your communication which kept me current on its status was also helpful and effective." "Just to let you know I received the order yesterday. It is just what I needed. Thank you for the prompt delivery". "My cabinet is absolutely gorgeous. Even better than I anticipated"! "We love our new piece of furniture!!!! Easy to put together and it was delivered in four days!!!!! Thanks so much". I think that I've died and gone to heaven. this is EXACTLY the website I've been not finding for days, until I chanced on it during a frustrated search. If you had a mortar and brick store here, I swear I would go there and never leave. It's hard enough making myself leave the website. You are terrific, thank you very much - and I apologize for misspelling your name on my previous e-mails to you. Geez, great way to work on relationship building when asking for help - spell a person's name wrong. The effort your extended to me is certainly appreciated. You would think I was a large repeat customer by the way you responded to my requests/needs. I also received your other e-mail confirmation of my order and I am looking forward to receiving the shipment so I can finish my project. It arrived, and I have to say, it is PERFECT, THE BEST OF ALL. Thank you once again for the BEST customer service there is. "No problem. I wanted to thank you for your excellent customer service. My husband and I have recently purchased a new home and have had numerous customer service issues with other vendors. Thank you for being so prompt and helpful. Your company should consider you a great asset." staff member. I will highly recommend your company." "Just want to say I received our order of a Houzer sink & accessories in perfect condition in 2 days. The price was $57 less than we were quoted in a local shop & it would have been 2 weeks. I'm glad Houzer referred us to you. Thank you." "I just wanted to take a moment of your time to pay a compliment to Dalonda of your Customer Service Department. I have found her to be most professional, knowledgeable with an easy-going, charming personality. She is a problem solver and is most expeditious and efficient. Those are the qualities customers remember when thinking of Kitchen Source and recommending your company to friends, relatives and neighbors. It is one thing to have an order run smoothly and have a satisfied customer. It is the true test of your professional staff that when an order has a problem that the customer is still satisfied at the end of the transaction! Many thanks for having Dalonda on your staff." problem and no one really cared. restoring some of my lost confidence in "service"." "This is to let you know I have received the door replacement for my cabinet and after a long journey it is fully assembled and looking great :-) Despite those many unfortunate problems I would like to tell you that your customer service shines and I am giving you highest marks via Google Checkout." "My wife and I recently purchased a bathroom vanity from your company. Although we were a bit skeptical at first for ordering from an online company, the experience that we have had with Kitchensource has been beyond excellent! Our order arrived sooner than we expected and was exactly what we wanted! Thank you so much for your easy web site ordering system, great customer service and excellent product support. We have been telling all our friends and neighbors about it!" "I placed an order and Dettaree was the service rep. I wanted to take a moment to advise you that I was extremely pleased with the service she provided. I had several questions following my order and she was extremely responsive to all of them. "Got my lazy susan parts Saturday and had it installed. It's great! Just wanted to drop you a note to tell you how very satisfied we were with our recent order. Merchandise arrived very quickly and was in excellent condition. We will be recommending your site to everyone looking for these kinds of products, as well as using it again ourselves. Your site is easy to navigate, plus you have the best prices for the items I was shopping for. I look forward to receiving the stools. Thank you! I've had one for about two months. It really helps when you are doing a lot. This was perfect and so easy to install. I could not have found this anywhere else and it matches my cabinets perfectly. We received it and LOVE it. Easy to assemble and it looks great. The price was right and no shipping charges. Excellent! to be able to refinish our kitchen table and chairs to match. Thanks for a very nice product. I'm sure we'll be ordering from you again. Also, congratulations on quality customer service! ! Our Laundry center arrived within three days of ordering! It's altogether and really quite functional for my purposes. A real bargain for the price. Thanks for your promptness. I wouldn't hesitate to order from you again. "We are EXTREMELY SATISFIED with our merchandise. Thank you very much." "Thanks for the extra effort. I'll pass your company's name along to all of my friends and business contacts. You are an excellent employee and I hope your management knows that!" "We received the order and my husband has already assembled the piece. We are enjoying it very much, as well as the good service, pricing and no shipping features we received. Thank you, we will purchase form you again in the future." "I wanted to let you know I received my order, #144361 two days ago and I am very, very pleased with it. My husband assembled it, and stated that it is very well made and everything fit together perfectly. It's a fine piece of kitchen furniture and I will order from you again." "I received my order in just a few days and want you to know your service was great. Items were great quality and fit just right." "I placed an order for 'bar stools' on December 06, 02 and received on Dec 13th. I wish to extend you Michael, the gentleman who took my order, and the company itself for such a professional service. I could not be happier with my experience and will highly recommend this company to any interested party. "I wanted to thank you for the excellent service I received after an order online. I ordered two bar stools that were delivered damaged. I expected a hassle in trying to get things straitened out but was pleasantly surprised at how easily the problem was taken care of. I spoke with Michelle in Customer Service and she said she would find out the necessary information and call me back. In less than an hour, she took care of the situation and had ordered me two new stools. They have since arrived and everything is fine. I just wanted to take a moment to let you know that I appreciate the service I received. "I wanted you to know that one of your employees deserves a pat on the back! She was very helpful with an order that I placed today. I called her Tuesday to help me pick out a gift that I needed to work for our convention that is held in September. She was very helpful. I was in a bind and needed a gift that was made of hardwood. Arlene was very helpful and professional. She made it a lot easier for me by helping me on your company's website. Her name is Arlene Bell. She deserves a big pat on the back and a thank you! Also, I was impressed with your website. "I love your website...the choice is great...maybe too much"
" Just wanted to say thank you to Scott for helping me with getting the sink I wanted. With us Building the house ourselves, having people that are pleasant and helpful, is such a perk. Thanks again for making the picture easy. "Thank you very much for the prompt attention you gave my situation. It is always a pleasant surprise when I come across people/companies with your integrity and work ethics. I will look forward to doing business with you again in the future, and will recommend your company to others"
"Great Website, helped a lot in planning my next projects"
"Thank you for your telephone call concerning my order. If only one of the acorn pulls is available to ship immediately, I would indeed like to receive it asap. Please ship the other pull when it does become available. Thank you very much for your kind consideration in asking me my preference. It's one of the many things I enjoy about your site." "Thank You. I love your website"
"A marvelous website & I've only skimmed the surface!" Your customer service spirit and attitude is second to none! It is so refreshing to work with someone in retail that has a positive, helpful personality. Kudos to you! Keep up the good work and thank you for all your help!" Thanks a lot, you've been efficient, professional and fast, I really appreciate that." "Thanks so much, I have been very happy with this purchase and it is unfortunate that there were some slight damage. I greatly appreciate the quick attention to all my questions and the excellent service that has been provided." "I want to thank you for your help with my original counter top purchase and for your willingness to help me figure out the fit problem. I will definitely think of you all in the future when I need kitchen/bath products again and I will recommend you to my friends. "I would like to compliment you on the high touch service I received from one of your sales associates, Scott. He took complete control of a product issue I was having and saw it to a satisfactory conclusion. It did take multiple holds and two call backs, but he stayed with it until I was completely satisfied with the final outcome. It is this type of resolution ownership that will bring me back to your Company in the future. Congratulations on the hiring of such a responsible proactive employee." "Thank you for your excellent service ..I received the order today ..It's a pleasure doing business with you and will certainly look to your site for any more items I may need in the future"
"I just want to thank you for sending me a new top for my kitchen isle. Your service and quality is beyond most vendors that I deal with. I will recommend your company to all my friends and co-workers. I was really surprised when the UPS truck showed up with my new kitchen isle top. I did not know that you were sending it, but deeply appreciate your fast and considerate service. Again, thanks so much"
Thank you for the quick shipment and the good service"
"I received my packages. I am very happy with the quality and timeliness of shipping." "Your Item just arrived here. Thank you so much. I love it"
"Hi: Received the panels today ... Just wanted to say thank you. They are perfect!" "What a pleasure to do business with you over the past Christmas holiday. Thank-you for your efficient service." "Hello, Your service was great, your customer service helpful and polite, your website had all the salient information regarding the product, was easy to use, and clearly posted your customer service number, delivery was speedy, and your prices were great! I will highly recommend your company to my friends and anyone looking for kitchen/cooking products." "I love the product you've sent." "THANK YOU for the EXCELLENT service! I'm SURE I will be purchasing additional items in the future." "We received our order a few days ago and I have assembled it. We were pleasantly surprised. It was of much better quality than we expected. We were also impressed that the hardware packages were clearly marked and contained extra screws. Thanks for a great service and a great product." "Just want to extend a thank you your company for dealing with my minor problem with a purchase with promptness and politeness." "Thanks for your help. I wish I had purchased it from you (or said I did, ha ha). In all honesty, I didn't. I purchased it from Bed Bath and Beyond years ago and they don't carry it anymore. Again, I want to say thank you. I can't say enough about the level of customer service you have provided. I commend you on your efforts on my behalf and say that its people like you who are the BEST advertisement for your company. I will certainly use your company for my next purchase and in the meantime I will pass on the kindness you afforded me in this endeavor...I promise you that. Thanks again!" "Doing business with Kitchensource.com was a pleasure. I received the item within 5 days. It was packed well and arrived in good condition. "I rec'd my order and love it! great workmanship. Thanks!" "I've received and installed the range hood already. What a truly magnificent piece of equipment!! One of the most beautiful made kitchen accessories I've seen; outstanding machining. As well, the blowers are exceptionally quiet for the volume throughput." "It was a pleasure doing business with you. Your web site is easy to navigate and quite informative, and your customer service reps were friendly, knowledgeable and helpful. All in all, a good transaction! I'll be happy to shop with you again in the future." "I have have just installed my new Sirius Range Hood - The finish is exceptional... the quality of stainless steel is excellent... the build quality is very good - it's sturdy and well built. Even on high, its not that loud, and its very very quiet on low"
"I received my Sirius Island Range Hood style: Sch23, with the glass canopy last week and had it installed this week. It is sharp, and gives my kitchen the look I was after, really contemporary. The fan is so quit and works great too. Thanks for the painless ordering system, and prompt delivery." "Last month we purchased a Sirius Model #SU101-SCH32 from you. We just installed it today. It's just beautiful!" "Its beautiful...everyone who looks at it thinks its the best looking hood they have ever seen"
"It has a stylish look and great value"
"We love our Sirius Range Hood! It's one of a kind, very unique. It fits in our kitchen very well. It's a super unit." "As advertised it is incredibly quiet, very powerful, and uniquely elegant. The remote control allows you to place the hood in the most ideal position." "Service was great......very pleased w/product"
"we received the hood and it looks wonderful. Thanks for making this an easy transaction." "This was the most pleasant and efficient transaction that I've experienced in years! Thank you." "Thank you for being so helpful. You all have stepped in and I really seriously appreciate it. I can't say enough good words. I've been treated very well by you all and I'm very appreciative. My order was so expensive and I was buying online and it has worked out very well. Thank you so much." "I am extremely pleased with my copper hood. The craftsmanship is superb! I love the design and functionality as well as the warm look of the copper. It works quietly and effectively and has become the focal point of our kitchen." "Looks wonderful, worked out great -- it's pretty quiet. Much quieter than my Vent-A-Hood." "The fan (Rangecraft Exhaust Hood) worked fantastically. You can expect a lot more business from us." "Its wonderful in a 1950's house...extremely happy"
"Beautiful -- we love it. It's just great, we're very happy." "Thank you. This is excellent service. The other companies I spoke with said it would take twice as long. I am delighted to receive this so quickly, because it means we can get our kitchen finished before Christmas." "We received the range hood the other day and it looks great. Thank you for the great service. You guys have an excellent web site." 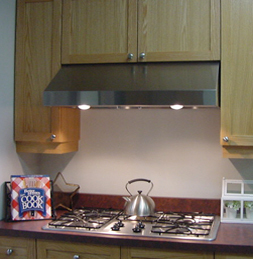 "I recently ordered a Rangemaster #RM503004 30" wide range hood. Very pleased with the delivery and the product...easy, well priced, it's in and looks very good. "Just wanted to let you know that we received our Range Hood just the other day. THANK YOU for the Great Service. We really appreciate the speedy expedite. Now, keep your fingers crossed that everything will go right into place when this is installed!!" "This was the last stop in an exhaustive search for a range hood that would meet the criteria of a small budget, higher then 290 fan speed, aesthetics, and existing condition parameters. I couldn't be more pleased, right down to the visible care taken in the packing for shipping. A combination even more satisfying given the fact it's designed and manufactured in the USA. Thanks for having this in your product line, with all the information, the process was very efficient." "It's a wonderful hood -- my wife loves it." "We love the hood because it doesn't block a lot of kitchen view. I will call tomorrow (Wednesday) to order a third one"
"The customer service at Kitchen Accessories was good and they were responsive to my questions. It was also a great price"
"You guys are awesome!!!!! I received my hood in great shape in less time for less money it would have taken me to order one locally, I will definitely not hesitate to order from your folks again and I will tell everyone I know how great your service is!!!!!!!!!!" "I just wanted to say thank you for your quick service. I ordered a Broan Allure III range hood and received it within a week. When I went to Home Depot, they told me it would take at least a month. Plus, you were $75.00 less than they were." "I just wanted to let you know how happy I have been with your customer service. I ordered a Broan Alpine Canopy Range Hood online, and received it within a week. I was happy with the online selection; I was able to find just the hood that I desired. When the hood arrived, I found there was some small damage that must have occurred during shipping. I worked with Arlene in your customer service department to resolve the issue. She was so helpful and pleasant on the phone. It was also great to get a real person so easily when I called your customer service line, and to be referred easily to Arlene without a lot of red tape and waiting on hold. All in all, it's been a real pleasure doing business with your company. One never knows when ordering online how it will work out...this was a very pleasant surprise. Thank you !" "Wonderfully effective...like a vacuum cleaner with less noise." "Hello, it's a beautiful day here in California, just wanted to let you know, we received the beautiful Pristine Living #1018S and, it works wonderful, my joy is it concise with the decor, now I have nice fresh rooms through out the house. Thank you so much for being there." "Arlene, Thanks so much for the prompt and efficient service. I recieved the new hood fan and replaced it yesterday and it works fine so far. I also sent the defective fan back today Fed Ex. Internet buying can working well for me because of companies like yours. I feel that it is very easy to shop this way and the return process was easy. Thanks again. " I RECEIVED MY RANGE HOOD IN JUST A FEW DAYS FROM ORDERING IT, IN GREAT SHAPE. IT WAS EASY TO INSTALL AND LOOKS GREAT. THANKS FOR SUCH GREAT SERVICE. I WILL DEFINITELY DEAL WITH YOUR COMPANY IN THE FUTURE. THANKS AGAIN. I couldn't be more pleased with your service and professionalism. "I want to thank you for the fast replacement of the hoods lost by UPS. The hood is exactly what I was looking for. I am very happy with the merchandise and the service by your company. Thank you." "I ordered a wood range from your company. I received it this week and am totally thrilled with the product. It is absolutely beautiful. I can't wait to get it installed. Plus, the delivery was so fast. Thanks so much. You can be assured that I will return to your company for other products." My range hood arrived on 10/27/99. It is everything I hoped for. Thank you for your help"
"Our Range Hood is beautiful just matches our new off-white kitchen range"
"Just wanted to express my complete shock and utter amazement at how my order was handled. I special ordered a range hood on April 1. The confirmation advised to allow 3 weeks + transit time for delivery - fully expected. On April 2, the range hood was on my front porch, in Virginia! I thought someone was playing an April Fools joke on me. It would have taken me longer to have driven downtown to pick it up, if any store downtown had it (which they didn't). I know this can't happen every day, but even once seems incredible! Maybe your name should be the "Incredible Kitchen Source Store. Thanks again"
"Thanks for the follow up. Received the SS back splash with absolutely no damage and much quicker than expected. The back splash looks great after installation. My compliments on your services and excellent quality merchandise! Have bookmarked your site!" "We received our shipment today. Just changed the order on Tues or Wed! Great Service! Keep it up!" "We got the range hood Wed. and installed it Sat. It works great and really complements my kitchen, so glad we took time to research for the perfect size and product. I didn't realize that I had been cooking in the dark until we cooked our first meal under the range hood. Thank you and your Company for your assistance"
I had the pleasure of dealing with Arlene when I purchased my Enclume Pot Rack. I must tell you that she is a credit to your company. She answered my many questions and was extremely helpful , courteous , patient , and knowledgeable . Thank you Arlene for giving me such excellent advice , and for bearing with me re measurements etc. etc. etc . ------ I couldn't have done it without you!" PS I love my POT RACK !!!!! "It is always a pleasure doing business with you and my pot rack looks great, and most of all it is so much easier than storing them in cabinets." "Very impressed with your service and the rack." "It's beautiful. You should see it -- it's gorgeous." "We bought the PR16B Brass Oval Pot Rack. It is gorgeous, classy, and an example of outstanding workmanship. I would recommend everyone getting the grid as a planter sits beautifully on it. It was also the best job of packing I have seen in a long time." "It was such a pleasure dealing with you recently, here I am again. I am so happy with my Enclume ceiling rack, which came even faster than you had predicted, and it's fantastic!" "I received the rack. As the Aussie Crocodile Hunter on the Animal Planet cable channel says "Whot a beaut'y!" "It looks great - really nice"
"Can you believe it! The silly thing is here! Boy, is it beautiful! Wife loves it! Its only been a week! Enclume did a right quick turnaround! So did you guys. Great customer service!" "Just wanted to let you know, the rack arrived with the grid (much quicker than I had expected), and the photo attacked shows it installed! Thank you very much! I'm very impressed with KitchenSource and will use you guys again!" "Got My Pot Rack Today!!! It is wonderful!!! Thank you"
"Thank you for the very quick shipping, I had it before Christmas. I will shop your company again." "...arrived today. We really like it, it's beautiful." "So happy with it. It looks wonderful in our kitchen." "It's beautiful -- we love it." "It is just beautiful and will fit with my client's decor perfectly." "You guys did a GREAT job of shipping out my order for a M&B pot rack (I think it went out the door the day that I emailed to check on its status). We installed it on the wall and it looks great. "I received my order and I love my pot rack. Very easy to hang and it looks great ThankYou for your promptness . I would definitely use Kitchen Accessories Unlimited again." "Thank you - we received our gar pot rack and hung it this weekend its great.....!!!!!" "Thank you. The pot rack is just what I wanted!" "I just received the wonderful Rogar pot rack I ordered from your company. It is beautiful and fulfills my every expectation. Thank you for filling my order and for providing such a great web site to shop for such items. Best wishes for a beautiful holiday season." "Pot rack received and mounted. A lovely addition. Many thanks and good Holidays..."
"I love the rack, it's fantastic and it looks so good. I've had pot racks before and they never worked out, but this one is beyond exceptional. Call me in TN if you're ever around the neighborhood and I'll have you over for cookies! I just want to take a picture of the pot rack and send it out to all my friends!" "It came on Friday and it is beautiful -- EXACTLY what I wanted. I'm very happy. ...Thanks again (it really is perfect!)" "The rack is beautiful - it's really sweet." "It arrived today and its already hanging. I'm very happy with it"
"I just received my Rogar pot rack from you and love it"
"My husband and I ordered a Rogar Hanging Pot Rack a few months ago and finally put it up - we love it, it is wonderful." "This is a GREAT product. Have had one several years but my home buyer wanted it BAD when I sold my home. This will be a replacement unit to hang in my NEW kitchen. Keep up the good work!" "I just received the wonderful Rogar pot rack I ordered from your company. It is beautiful and fulfills my every expectation. Thank you for filling my order and for providing such a great web site to shop for such items. "I just wanted to let you know how very pleased I am with my order. Not only is my item high quality, it was received in record time and I didn’t even have to pay for shipping!! You have great company ethics and I will recommend your company to all of my acquaintances. Thank you." "The rack is fantastic. We love it and we are very happy with the service." "Very happy with the rack. It matches our maple cabinets perfectly"
"Thank you for your prompt attention and service. When you called to say my order was not in stock and had to be special made I was willing to wait for the product I ordered. When my beautiful new pot rack arrived before Christmas, I was very, very happy. Thanks to you and the iron artist, maker of the pot rack in Idaho. I truly appreciate your effort to make sure my order arrived before Christmas. You are great and I will recommend your service to anyone." "I recently received my Metal Art Wild West II Pot rack, and I've got to tell ya the comments from friends and family have been wonderful! From the design all the way to the superior craftsmanship, you can see there is pride and care behind the product. From my point of view it was a nice experience as far as being a reasonable cost, ease in ordering, and getting the personal attention in follow-up from your customer support"
The Western Pot Rack arrived today with no damage. Thanks for taking that extra measure to ensure a safe and damage free shipment. I like the quality and design and I'm sure it will be a great conversation piece in my new kitchen! Thanks ..."
Just wanted you to know that I am so happy with the look of my Black Cambria Oval pot holder; it looks great! I hung copper pots and pans and long spoons with black iron handles and sifting ladles. Anyone who has seen it, loves it and so do I. "It's absolutely gorgeous. I'm so happy...very well made. "I'm absolutely thrilled with my pot rack...it's gorgeous!" "I am so impressed with this, it looks so great...incredible...very beautiful"
"We received our beautiful pot rack and it is already hanging in our kitchen. It is very well made and we are so happy with our purchase. Thank you for your good service too." rack) and your service exceeded our expectations. Many, many Thanks!" "Thanks for your fine service. Our wood pot rack is perfect"
"I received my pot rack today, and it's beautiful. "I just received my order today. I assembled it and it looks great!" "I recently ordered a pot rack from you and love it!" "Received my order and I'm very pleased with my new pot rack plus the speed that it was shipped. Thanks again"
Glad I found your website online. Ordered a beautiful John Boos kitchen island, after contacting your customer service for some information. The female who took my order was very helpful and pleasant to deal with. The Boos product shipped in time for giving to my wife for our 44th Anniversary. Thank you for your help. Love the butcher block. Gorgeous!!! quite sturdy and I am very pleased with my purchase. Thank you. picture said it would be - which is exactly what I wanted. I'm thrilled. I just received my new kitchen cart. I want to thank you and your staff for your prompt service. I have limited space in my home and this new cart just fills the bill. I am so pleased with my merchandise and your level of service. Even the FedEX driver was so nice!!!!! "I recently order a Boos cart from you, and was very satisfied with your price and service"..
"John Boos carts are well put together, have excellent construction and lifetime." "My John Boos Hard Rock Top is beautiful... it's fabulous." "I love it... it's so easy to keep"
"Everything is fine.......I appreciate it"
Got it.... Thanks, I love it !!! Quick and great product and price........I already referred friends. "My husband loved the table, It was his birthday. we received it on July 14' 2004. "Got it yesterday WOW ... Really looks great ... will work to get it together this evening; very impressive!" "My John Boos table arrived yesterday. My husband put it together last night (very simple assembly!). It looks fabulous! Thank you for such a great addition to our laundry room." "I ordered the Catskill Grand Americana Kitchen Island from you. I absolutely love it and have had a great experience with the Catskill Craftsmen customer service. How can I leave a testimonial for this great product and the great customer service I have received? I want everyone to know what a great quality product this is and what a great company Catskill Craftsmen is". "I ordered the Catskill Empire Kitchen Island with the 2 pull-out leaves and I'm extremely satisfied with this product. It is exactly what I was looking for which was ample storage for all of my pots and pans. And it gave me extra countertop space that was needed in my small kitchen. My husband built it in less than 2 hours. We both are extremely happy with the end results. We highly recommend this product for anyone looking for storage, countertop surface with a stylish look." "Dear Arlene: we got the cart and all I can say is that it is great! The quality of this piece is exceptional especially for the price. We are very happy with it. Assembly was very straight forward also. They are a good company. thanks again." We received cabinet yesterday, 3/8/07, and it is perfect. We assembled it last night and was fairly simple. This is exactly what we were looking for and we are thrilled with the quality. Thank you for your excellent customer service. We will be back to shop at kitchensource.com. "Thanks very much for the good service. I got the board today. Its very nice"
"I received my Catskill Craftsmen #80030 Cottage Collection "Preston Hollow" Island last Friday. I just LOVE it!! It went together without a hitch...and I am no mechanical genius by any means. It took me about 2 hours, but I did it all by myself. Thanks for the great service and great product"
"Just received my order today. I assembled it and it looks great!" "I would like to tell you how pleased I am with the work center we purchased. It was more than I expected. I was a little hesitant about purchasing our work center online, but after it arrived and I got it put together I knew we could not have done better." "My mother loves it. That's why I'm getting her the island now." "Just ordered and received a Catskill cart. Great service! Great Product! Complete directions. I will tell my friend about you. Thanks." "I love it. In fact I'm thinking of getting the microwave cart as well. The extra storage is great. It's beautiful"
"I love it...it's great...real nice"
"thanks we have received the cart and assembled it. we love it. everything went together easily and it looks great in the kitchen. thanks so much for the wonderful service and product. we will definitely shop at KAU again." "I received my order I was very happy with the island my husband put it together and it was a much better quality than I had expected. Thank you for the good customer service." "I just received the double door jelly cabinet. I LOVE it. It is just what I wanted and looks great. A fantastic quality. I am now looking to order another cabinet that's a little bigger. I'm sure you'll here me soon. Thank you." "Received table. I love this table and I am very glad I ordered it from your company." "I received my order yesterday for the Catskill Contemporary Kitchen Cart and I am very satisfied with the quality of the item. Thank you for your quality service." "We are VERY pleased with our butcher block products and thank you for your good service! I would recommend Catskill products and Kitchensource to anyone!" "I just received my Catskill Craftmen Grand Workcenter w/drop leaf. What a wonderful surprise to see such a quality product. It was even better than the picture. The instructions were easy to read and and set up time was 1 1/2 hrs. I didn't have to apply its first coat of oil, it was already there. I will be ordering more from you." "Just wanted to thank you for your great service and product. Ordered the HomeStyle Kitchen Cart HS-5023-95 by phone. The sales lady was so nice and was able to give me a couple of tips about putting it together. She had one of the small carts. It came within 3 working days. Had all parts. Directions to put together were super. From start to finish it took me right at 2 and 1/2 hours. Your Allen wrench and my Phillip's head screwdriver and it was done. Again, thank you to all. A great staff - a great product." I also want to mention that I love my kitchen island! This is the first major purchase I've ever made from an online business. I appreciate your company going thru the trouble of being a member of the BBB. I never would have made such a large purchase without your company being recommended by them. I will eagerly recommend Kitchen Accessories to my friends and family!" "Just wanted to let you all know how much we like our new kitchen island. We received it yesterday. It was easy to assemble and we were happy with the quality of your product. Thank you for making this a happy buying experience." "I recently bought a homestyles 5023-95 kitchen cart and just wanted to sat i love it.it took me 3 hours to assemble it.all the parts were there it was very easy to put togther and i am impressed with the quality.i read the reviews before purchasing and was still a little leary but i am very happy with it." "I ordered a Home Styles 5099-95, Napa Kitchen Center online placing the order last Saturday evening. It was on my porch the following Tuesday. believe how fast it was shipped and delivered. Very reasonable price as well. Thanks again". "FYI...We rec. our Kitchen Island this morning and my wife already has it completely assembled and just loves it..in her words...Thanks again". "Just a comment to let you know that on our order we were very pleased with the product (a kitchen cart), the fast delivery and your price. We found the same product several other places on the web for two hundred plus dollars more (both price, shipping and handling cost considered). Thanks for the great service". expected; a very unusual happening these days". "The order process was simple online, and I was advised rapidly of each stage of shipment. Shipment came within the week! The only improvement could be some kind of handles on the box as I had to drag it into the house off the porch, which was difficult given the weight -- and I'm a very small person. I put the rolling cart together with the supplied allen wrench, and it went as smooth as ever. Directions were clear and easy to follow. We completed assembly in about 45 minutes. This is a great addition because my kitchen is small in my old house (1925), and I needed extra counter space. The cart rolls around easily in the space, has plenty of storage and is the height of my counters. I could roll it into the dining room if I ever needed it there. I put my most used spices in the top drawer; knives in the block stand, and on the shelf put all my tea choices plus some other things such as a cup/saucer and strainers; and in the cupboard below, placed all my flours and baking stuff. This significantly opened up space for canned goods in a cupboard area. The point of buying this piece was that it was freestanding, rolled into place yet had brakes, and opened up cabinet space for canned goods--and it has met all of these needs. It turns out the butcher block top close enough matches my counter tops, and I just love this cart. It's modern, functional, and pleasing to the eye. I also like that your site offers butcher block care instructions. A very happy customer, and I will tell my friends about this website." "Thank you very much, we received the cart as your email indicated and right on schedule. It is together and a very nice piece of furniture that adds to our kitchen. I want you to know my wife and I looked all over and nothing really caught her eye, she then asked if I would look around on line to see if I could find anything, somehow I stumbled into your site and found that cart at a lot less then we saw things in local stores and much better appearance and materials. Thank you again for your time on the phone and your companies prompt service." "I received my order in battered condition BUT it had been packed so well that the hole in the side of the box did not affect the item. I was so pleased that it was so easy to put together, such good quality, and really pretty. Thank you so much. You have a new customer. I'll have to go back to your site and shop when I redo the kitchen next year." "I just had to write you and say I am so happy with my Kitchen Center. # 509995. After I got it put together I just stood back and looked at it. It is well made, attractive to look at and fits perfect in my little kitchen. Believe I got a very honest deal from your company, wanted to take the time to just say "Your okay in my book"." "Got it! Built it! Set it up! Love it!" "It was packed extremely well with all pieces protected. I am truly surprised and excited with my purchase. I put it together by myself and had no problems with anything. It does have a little less storage than I imagined but that is my fault. I am extremely pleased with this product and just wanted to let you know. Thank you for such a great product." "I bought a Home Styles Kitchen Center with Breakfast Bar HS-5089-95 just over a week ago. Your service was excellent. The unit was delivered very quickly and its quality was great. The instructions for putting it together were clear and easy. Will not hesitate to buy from you again and will recommend you to our friends." "I would like to tell you I received the kitchen cart, and found it was easy to put together, I am very pleased with it and consider it an excellent buy for the price paid, and will recommend friends to your site." product, you are at the top of my list. "Sir, I just gave my bride a kitchen cart for Christmas, it was a HIT! Just to let you know, the assembly was a snap!!" I am 67 years old, and I had a stroke a few years ago, but the instructions, and ease of assembly was a piece of cake! You did good!! Well Done!" "All I can say is Wow. I am so impressed with your company and your services I have told all my friends. I received the island cart and putting it together was a breeze. The directions were easy to follow, I didn't even need my husband's help. After putting it together I was so impressed with the construction it looks a lot more expensive than it was. You are my store in the future. Keep up the great work. Thank you again for making this a great Christmas." "Thank you for the lovely and useful Kitchen Center received as promised promptly and as described in kitchencarts.com. It does indeed bring a warming touch to our kitchen and we are very pleased. We are reluctant on-line buyers, you have helped to change our thinking with the value and quality of HS-5099-95!!" "Hello, just wanted to let you know that our kitchen butcher block island arrived today via Fed Ex and we already have it together! This was the easiest thing we have EVER assembled!! WE ABSOLUTELY LOVE IT!!! Thanks so much for a GREAT product!!" "I have never been more impressed with an internet order. I placed an order for the Homestyles Kitchen Center w/ Breakfast Bar on a Saturday. I received confirmation of the order on the next Monday and received the cart by Wednesday. Very impressive considering this was the week before Christmas. The price was great, the customer service was great and the product is of the best quality. Thanks!" "I got my island yesterday. My (adult) daughter and I put it together like we knew what we were doing - it looks wonderful. It's exactly what the picture said it would be - which is exactly what I wanted. I'm thrilled. Thank you for representing and offering this product. Cheers." "My kitchen island arrived yesterday and I immediately began to assemble it. The instructions were clear, all parts were there, and it took me about 1-1/2 hours to put it together myself. It looks beautiful, is quite sturdy and I am very pleased with my purchase. Thank you." "We received our cart on Thursday and my husband had it put together in about an hour and we absolutely love it. My husband said the directions were very easy to understand and very complete. i was a little skeptical about ordering it but I'm very happy I did. I will recommend your company to all of my family and friends." "We recently received #5021-95 Cuisine cart w/Drop Leaf from your company. We are very pleased with your product and would surely buy from you again. Everything was shipped right on time, all parts were there, and nothing was damaged or missing. Everything was marked and numbered just right!. We really love our cart and your company." "We got the kitchen island on the 14th of Feb., just like we were told. The packaging was the best I have ever seen. I don't know exactly how long it took to put it together, but it was only a few hours. It was all together & in the kitchen the same day it got here. The workmanship is exceptional and I am sure we will get a lot of use form the island. Thank you." "I got my island on Friday. It was sitting on my front porch when I arrived home! My 11 year old daughter practically put it together by herself! It looks great!! For any customers looking at buying one you can tell them they are so easy that even an 11 year old can put it together! Thanks!" "Though I thought it would take a week or two to receive this kitchen island, it was at my house within 48-72 hours. The quality of the product is excellent and it was much easier to assemble than any other item I've ever put together. (I didn't even curse one time while assembling it, which is probably a first!!) The product quality and finish is excellent and I am very satisfied with both the product and your prompt and efficient handling of my transactaion. ***** I give you my own personal 5 star raiting, for what it's worth." "The order arrived and I am really impressed at the quality and care used in shipping. I will certainly continue to shop with your firm. It was a great experience to find that integrity is still alive." "I received my kitchen Gourmet Cart from your company and I just love it. First I was told it would take about two weeks to receive and it came in about one week. It was so simple to put together, my 6 year old and I (both females) put it together in no time. I trust that I will get plenty of years from it because it is very well constructed and I put most things together in my home. While I was putting it together I could tell that it was very well constructed. I've purchased products like this before and the heads get worn easily or the wood is made from cork on the inside which doesn't resist damage easily. Your product is made out of solid wood and can stand pressure extremely well. I highly recommend your products, and I am in the process of looking at other products on the Internet form your company. Thank you very much." "I ordered a kitchen island from you and was a little skeptical about ordering it online. I had a bad experience with a cart I ordered from Lowes and had to send it back to them. I paid twice the amount for that one and it looked like a piece of junk. When your cart arrived I was extremely impressed. It was packed so well. It came with no problem. My husband had no problems putting it together. The instructions were very easy. The cart is beautiful. Very nicely made and very sturdy. I am very pleased with it. I want to thank you for the fast delivery and for the fine quality of product you sell." "received merchandise last week and very impressed with quality. thank you"
"Thank you so much for your unbelievably fast shipping. The kitchen table and chairs are exactly what we had hoped for." "My order has already arrived and been assembled...It looks great." "We received our island yesterday, thank you for fast shipment. We just love it, great doing business with you." "I recently ordered a Kitchen Cart as a housewarming gift for my brother and I just want to let you know how satisfied I am with the purchase. My brother, who used to build cabinets for a living, is very impressed with the workmanship and quality that went into the cart. He stated that the cart went together so easily and that the pieces fit beautifully. He was pleased with the cart and said it is one of the finest gift he has ever received. Thank you for helping to make my gift to my brother such a success! I have already shared your website with my friends and plan to purchase other products from you in the future. Thanks again"
"Just a short note to say I received the above item and am so pleased with the quality--etc...it is just as I expected if not nicer....thanks for your prompt service..."
"I just received my kitchen island from your company. I am thrilled with the way it came out, even better than I hoped." "I'm so excited for this wonderful adventure with your business site, I've made over twelve comparisons, none top your site the least!! I will be making additional purchases after I've received this one for my new home." "I bought a Kitchen Cart from you #HS-5023-95 and assembled it this past Saturday morning. I had a stroke 14 months ago and have very limited use of my left arm/hand. The entire assembling, even with putting the drawers together twice, only took 1 hr, 30 minutes using only one hand. again, brilliant engineering!! The cart is exactly what I thought it would be and looks great in my kitchen." "I received my kitchen cart 2 days ago which has a wonderful surprise considering it wasn't expected until the end of January. I'm writing to tell you how pleased I am with the quality of the products as well as and the ease of assembly. It took me about 2 hrs from beginning to end. The instructions were clear, concise and required no special tools. I am thrilled with the service you have provided me and I will spread the word. The kitchen cart is beautiful and will serve me well for years to come." "My name is Kim Kloss and I just recently purchased a kitchen cart from your company. I bought it for a new apartment that I will be moving into next week, and I am writing to you to let you know that I had it put together last night and I just LOVE it!!! This was the first time I purchased something from your company, but want you to know how pleased I am doing business with you." "I just wanted to let you know that my mother received her kitchen cart model HS5035-95. It came in perfect condition. It was put together in 45 minutes with absolutely no glitches or problems. Nothing was missing and it was just a pleasure for the person doing the job. It is absolutely gorgeous. The workmanship is superb and the design is just so useful... the wood top is so smooth... I cannot believe the quality of this product. It is made so well. I would recommend your company to anyone in the future." "I have not seen the equal of quality or workmanship to your offerings. I purchased HS5023-95 and am well pleased." "I have recently received the cabinet I ordered in good condition. It was easy to put together and looks great in our kitchen. I just wanted to say thank you for a quality product." "I ordered a kitchen island from you (Home Styles model HS-5015-95) and wanted to tell you how impressed I was with the service, packaging, delivery, and product. I purchased it as a Christmas present for my fiance and he loves it. It definitely is high quality and will be perfect for our use. Also, Arlene was a big help during the purchase process as I had originally ordered it too early and needed to delay shipment. She kept up-to-date with the order and shipped it at just the right time. We both will recommend your company to everyone with kitchen needs. Thank you again for the wonderful service." "Just wanted to say thanks for the rapid shipment of my order. Very impressive." "Hello. Thanks for a very easy to use website and beautiful looking products." "I want to thank you very much for my order. It was extremely easy to put together and everything I expected it to be. Thanks for a great kitchen island." Thanks! I received the cabinet yesterday and assembled it today. It is absolutely beautiful. Thanks again from one very happy customer." "Received the kitchen island this morning! FAST service, I'm impressed! Now I have to put it together! Thanks"
"Thank you, thank you--got my butcher block kitchen cart today. Put it together easily and I love it." "We got it! It is fabulous and it looks wonderful in my kitchen. I took pictures the whole time my husband was putting it together. It took him 3 hours, but it wasn't hard. I was tremendously impressed at the thoroughness of the manufacturing and the high quality of the wood and the design. It's sitting in a place of honor in the center of my kitchen and I LOVE IT!!!" "Our Home Styles butcher block kitchen cart has already reached us, it's assembled and in our kitchen . It looks great! Assembly was easy and it's a great product. Thank you for such a smooth transaction -- from purchasing on your website to the quick shipping." We recently ordered the Homes Styles Kitchen Cart and I just wanted to say how pleased we are with the product - it is more beautiful and functional than we expected. It was also great to receive it so promptly. Thanks for providing a great shopping experience!" "I wanted to send some positive feedback and hope you will pass this on to the appropriate persons including Home Styles-customer service. My order arrived and this has been one of the best experience that I have had with put-together furniture. The quality of Home Styles furniture parts, components, and entire product are wonderful. The directions were pretty good and I am very pleased with my purchase. I will be recommending Kitchen Accessories and Home Styles Furniture to others in future. Thank you for providing great customer service, follow through, and a terrific product." "Just a note to lt you know I received my kitchen cart on the 23rd. I am extremely pleased with the quality of the cart and how easy it was to put together." "Received the product and LOVE IT." "Hello ....... wanted to drop a quick mail to tell you how happy I am with my kitchen island. It was delivered last week and my husband put it together yesterday. It is exactly what I wanted. The quality is perfect. Thanks again." "I received the order and wanted to comment how pleased I am with the value it represents but more so with the precision and ease of built. I give it five stars"
"My husband and I want to commend your company for such a wonderful product. The construction to the packing was perfect!! To be honest ---- I had ordered another one from another company and it was broken and just no quality that your product has. We would like the president to know how much we love this product and will recommend your company to all of our friends." "We just want to take a minute to thank you for our order. Let us say this was the best thing we ever did. You order came earlier than we expected, plus the directions to put it together were so clear, everything was marked and everything fit just perfect. We are very very happy with our island and we owe it you and your fine"
"We received our order today 1/13/06. It arrived in very good condition. We were very impressed with the care taken to protect the merchandise. I put it together with no problems, we are very happy with this purchase. "Received and assembled my cart, it was so easy to put together and I wanted to let you know your service was better than great, I really love my cart, thank you"
"Thank you I love it and looks great in my kitchen, and it was not hard to put together at all. I am a realtor, who has an office in her home, I have told several of my clients how much more I SAVED OVER THE INTERNET. Thanks again"
"We received our kitchen cart 2 days after your email that it was shipped, just wanted to thank you for the great service and let you know how impressed we were with the quality of the cart. It's a stunning addition to our kitchen that we couldn't even come close to finding in our area home improvement stores. Thanks again"
"I cannot wait to get my island, your prices are wonderful. I saved a lot buying it from your company. Thanks." "We just received a kitchen cart that we ordered on your website. I've never seen anything packed so well. While there were quite a few parts, the instructions were very well written and my husband was able to put it together during commercials while we were watching television. I was pleasantly surprised by the quality and sturdiness of this very nice piece of furniture. We'll be ordering from you again. Thanks!" "It's awesome. Delivery was great and packaging perfect. I love it." "I received the kitchen cart I ordered from you. I couldn't believe how fast it arrived! You have exceptional customer service. My husband put the cart together and it looks great in my kitchen. It's been well used every day since, and I really love it. Thank you for a great product and service." "I simply want to thank you. I received my kitchen island & was almost overwhelmed when I saw all the pieces. However, the instruction sheets were crystal clear, everything labeled so well & EVERY predrilled hole matched up [that hasn't always happened when I get something with some assembly required. And to top it off, the piece is beautiful. I couldn't be happier. Thank you again." "I received the package today (less than 3 days for shipping) in perfect condition. Assembly took less than 45 minutes thanks to the easy to follow instructions. Beautiful kitchen island and I am completely satisfied with your product. I'll be back!" "Hi, I just wanted to tell you how much we like the kitchen cart we purchased from you. It is so well made and very functional. It was of great use during Thanksgiving. We'll be sure to recommend you to our friends and family! "I just wanted to let you know the item I ordered arrived today, less than three days after I bought it! The item, a kitchen island cabinet, was super easy to assemble and I am completely happy with it. Great product and you are a great company to do business with. Next thing I need, you will be the company I trade with. Thanks again for a great value for the price!" "It's not often that I get the chance to say thank you to online shopping services. However, the treatment and service I received from your site and the personnel that I had the chance to talk to were extremely helpful,as well as courteous and very kind. My order was processed and delivered in less then a week. It arrived in excellent condition by UPS and the driver even helped to carry it into the house. My Kitchen Island Cart went together in no time, thanks to the excellent packing and thought for the customer receiving the package. I had it together in several hours and was able to make my wife a pie that evening. Wonderful... wonderful service. I look forward to ordering more from your great site. " "We received our order and assembled it. it is perfect. Great customer service. We'll purchase with you again and tell others. Good pricing and no shipping - Bonus!" "Just got my cart and I love it"
"I just wanted to tell you how happy I am with my purchase, I bought the Covington Kitchen Work Station with Granite Top and it is much better than any pictures can portray. The assembly is really easy and fun. Your site and prices are the best and I was hoping to share this with other customers." "We got our Snow River SR-70213 and love it"
"I ordered the Cuisine Cart Cabinet and could not be happier with this product. It came in just a few day after placing the order. It was packed beautifully had easy to follow instructions and looks great in my kitchen. I will make sure everyone I know, knows where I purchased the cabinet and what a great company you are and what a great product you sell. I would give you 5 stars." "We received our Mix and Match Kitchen Cart Cabinet w/ Red Paint and Black Granite Top today. The first thing that struck me was how well packaged everything was; I think the box could have fallen off the truck and nothing would have been scratched. The cart is clearly well thought out with ease of assembly in mind. The instructions are clear and everything necessary was included, with some extra hardware too! On a scale of 1-10 of "handiness", with 1 being unable to use a screwdriver, and 10 being a professional carpenter, I'd consider myself a 5; the whole thing took about 2 1/2 hrs to put together at the end of a day. It looks great, and feels totally solid; I think this a testament to the cart. I'd recommend this to anybody". "Thank you for a great product...and we did receive the replacement granite top...on my order of SIX of this cabinet. The vendor finally did ship it to me.....and I thank you folks, very much, for following through on it!! You are terrific to do business with, and we appreciate you very much! I'm now referring customers to you, left and right. Looking forward to this one, I'm ordering today. I guess these cabinets are like "potato chips!" They fill them up and then say, well, "we need more!" Smile.... "
"We received the cart today and were very pleased. I assembled it and am very happy with the quality and easy instructions. We will be buying from Kitchensource in the future and will let our family and friends know about the company. " "I will never hesitate to order these cabinets again, and to recommend them to other clients. I am SO impressed with the quality for the price....I can't tell you !!! GREAT PRODUCTS !!!" "We purchased our Mix & Match 2 door w/ 4 drawer Kitchen Cart Cabinet in Black with Granite top. It is exactly what we wanted. It is so easy to put together. The quality of this product is wonderful and the price is great too!" "Got the drawer bottoms, finished assembly of the unit and I gotta tell ya, I'm impressed! Went together perfectly and looks great. I couldn't believe that it's all solid wood - no pressboard! A super value and well worth the cost." "We finally assembled our cabinet and stainless steel top. Wow - we are absolutely thrilled with it. The quality of the cabinet was extraordinary, the instructions made assembly easy and the speed with which you filled out order was great. You have made a life time customer! "I received my kitchen cart yesterday and I just had to write and tell you hoe very please I am! I am the "handyman" in my family and I have much to much experience with assembling furniture. This cart is a dream to put together. I actually had fun! The quality of the product, the clarity (for once) of the instructions, and the beauty of the cart compelled me to send you this note. Thanks especially for taking care of my order, Dettaree, so everything arrived properly and on time." "I received my Mix & Match Kitchen Cart with-in the week of ordering it and am thoroughly pleased. My husband wasn't real thrilled about having to put it together, but bragged about the quality of material used for the cabinet. We choose the natural base w/ a granite top. It is solid as a rock and absolutely gorgeous ! I had several friends over for the weekend and they wanted to know where we had gotten the 'rolling island'. I have been sending them your web address and feel certain they will be contacting you very soon. Now I'm looking for something else to order from you - you all are Great ! "You guys are wonderful!! I placed an order with you on line and everything went so smooth! I love the product (kitchen cart) but that's not why I am writing. It is because you give me faith that there are real companies that do honest and good business! I placed a $400 order on the same night I ordered with you with another company. I was trying to buy bar furniture. That was a nightmare! They oddly had captured all the funds the next day, and two weeks later I still had heard a thing from them and spent days trying to track them down! Finally had to call my bank and have them get my money back. I was so scared and disappointed. Plus I really wanted the product. I thought I would never order on line again. Then I got my product from you guys, on time, as promised and in good order. Thanks for just being real and treating customers with value." "Michelle - Thank you for your prompt/professional assistance. We couldn't be more pleased with your courtesy and service. We look forward to doing business with you in the near future. Please pass this on to your supervisor. You should be commended for your representation of the company for which you work." "Very prompt delivery. Took two of us two hours to assemble, only one screw's location gave us difficulty. The cart appears to be just what we were looking for and at a very reasonable price. Thank you." "Just a note regarding the kitchen utility cart that I recently ordered. The whole process -- from ordering and receiving it in a timely manner, to it's completion -- was a positive experience. It arrived in perfect condition -- each piece was clearly identified -- and all the parts of the puzzle (nuts, bolts, etc) were there to complete the assembly. Efforts to keep it from being damaged proved to be excellent. The assembly, while a little time consuming, was basically easy. Bottom line -- excellent product -- we are satisfied with the results!!" "I got my tables today and they are better than I had hoped. Very solid and easy to assemble"
Diane Mitchell on the Bridgewater Gallery Classic Table "BW-FE3006"
Thank you for taking the time to look that up... your excellent customer service is refreshing. Please forward this email to your supervisor or pass on their email as you should be commended." "JUST WANTED TO SAY HOW PLEASED I WAS WITH YOUR COMPANY AND THE BEAUTIFUL 'WINSOME' KITCHEN TABLE AND CHAIRS I ORDERED. IT'S A BEAUTIFUL SET AND THE FOLDING TABLE IS PERFECT FOR MY SMALL SPACE. I LOVE IT"! "I'm just writing to say thank you. I received my order within 3 days. All items were included in the package and the cart was very easy to assemble. I will be using your web site again in the future." Thank You, a very satisfied customer. "I wanted to tell you how pleased I am with my new kitchen island. The ease of assembly was incredible ! I am very pleased with the product I ordered and would defiantly recommend this web site to my friends. I will continue to shop your products." "I received my Kitchen Island on the day it was projected to arrive. Everything about this order went smooth as silk and the Kitchen Island was exactly as it was pictured as being. The assembly was very easy thanks to the workmen who did their job well. I am very pleased with your service and will remember your company when I need anything else". "I just received my order the wood top for my kitchen cart. Just when I thought I would not be able to get a new top for my kitchen cart your customer service came through to help me out. I want to express how much I appreciate you helping me purchase this item from you. Your company has shown great customer service. I Have already recommend your site to several people, and I will continue to recommend it to others. Again Thank You". "Received the kitchen cart in quick order, and assembled it in almost no time. I have to say that in all the years I've been assembling products and various items, your cart is the most beautiful, professional product that I have encountered. The wood was beautiful; the design was well done and sturdy; and the instructions deserve an award for the thoroughness and completeness. My compliments on a fabulous product! I'm very, very pleased". "I just wanted to tell you how happy I am with my order. It is beautiful. It was easy to put together and everything I had thought it would be. I bought the kitchen island on order 193572. Great deal and thank you again". "Dettaree, I don't normally get the opportunity to do this, but I wanted to say thank you for your EXCELLENT customer service. I asked you to find out if we could get our kitchen island shipped early, you told me you would call me the next morning with an answer, and you did. Then you kept following up to make sure that we knew the order was coming and when it was shipped. I am grateful for all of your assistance. Unfortunately it isn't too often these days that you get good customer service so I wanted to make sure I let you know how happy I was with yours. Again, thanks". "Today I put together the island I ordered from you. It is wonderful! Thanks you so much for such a nice product. Truly a value for the money spent". kitchen island we ordered from you. We absolutely love it in our kitchen. from when I ordered it online". items we have ordered from other companies". good quality products at a reasonable price". quite sturdy and I am very pleased with my purchase. Thank you". "I just received my new kitchen cart. I want to thank you and your staff for your prompt service. I have limited space in my home and this new cart just fills the bill. I am so pleased with my merchandise and your level of service. Even the FedEx driver was so nice!!!" "Thank you for the replacement door on our kitchen island. The service and the product are great. Thanks"
"We are very happy with the white and stainless folding top kitchen cart. After much shopping this was by far the best deal. This was better quality than what we saw in the home stores. It was the best price hands down and as added value there was no sales tax and free shipping right to my door. It just doesn't get any better." "I received your kitchen cart yesterday and put it together easily- the instructions were great. The finished product is a beautiful, usable cart that will serve well for years, and my wife loves it! A wonderful cart! "We finally received our Kitchen Island this week and today I found the time to assemble it. We are extremely pleased with both the quality of the "cart" and its delivery condition which is pristine. I expected that much of the external construction would be veneered pressed wood and was delighted to find most of it was solid Asian spongewood. Likewise the engineering of the components was outstanding, everything fit together as intended without any need to 're-engineer' any connections or fittings. Assembled, the product looks better than in your ad as well." "Thank you for a FANTASTIC transaction! I received the island on Friday and assembled it on Saturday. I must say that I am blown away. Shipping was VERY fast (I know it's out of you r control, but you processed and shipped ina very timely matter). The island was received in excellent condition. I am very impressed with all of the extra packaging included. Unlike most 'assembly-required' items I have purchased, I couldn't find a single scratch or blemish on any of the pieces. The pictures don't do this island justice. I'll stop my rambling, but want to thank you again for an excellent product! I'm going to recommend you to my friends and family." "I just wanted to let you know that I received my stainless steel butcher block cart and I'm very pleased with it. It was the easiest thing that I've ever put together, everything went right in place, no parts missing, and the directions were perfect. Thank you again for making my life a little easier." "We actually received the cart today!! Thank you for your prompt service!" "I received the kitchen island today and got it assembled. It looks great! "Received the cart in good order. No parts missing. Am 80 year old woman and put it together myself, was a snap." "I would like to tell you how pleased I am with the work center we purchased. It was more than I expected. I was a little hesitant about purchasing our work center online, but after it arrived and I got it put together I knew we could not have done better"
"Bought kitchen carts in February 2002 for my new townhouse that was in renovation stage. Just put it together yesterday and I LOVE IT"
"Thank you, I love my cart and the price!!" "I just wanted to take a minute to commend your company on it's excellent service & responsiveness. I received the Pastry Island which I ordered, and was completely satisfied with it's quality and construction. The entire process has been pleasurable , beginning with the prompt communication, indicating the back order status, thru to it's earlier than expected delivery and quality. Thanks again for your attention to the customer. I will definitely not hesitate to buy again or recommend your company to others!!" "We received the pastry table & my husband put it together 2 nights ago. The wood & the workmanship are beautiful & all the pieces were marked so it was very easy to put together. We love it & just wanted you to know how satisfied we are. The over all quality is the best." "WANTED TO DROP YOU A NOTE ABOUT MY ISLAND. I ASSEMBLED IT YESTERDAY. IT WAS VERY EASY TO ASSEMBLE, THE STYLE IS GREAT AND IT IS VERY STURDY. I SEASONED MY BUTCHER BLOCK LAST NIGHT AND USED IT THIS MORNING. I LOVE IT. I CAN'T WAIT TO GET HOME FROM WORK AND BAKE SOMETHING. I WAS IN NEED OF MORE WORK SPACE IN MY KITCHEN AND THIS IS THE CLEAR TICKET. THANK YOU SO MUCH FOR A FINE PRODUCT THIS IS VERY HARD TO FIND NOW DAYS. I WILL RECOMMEND THIS PRODUCT TO ANYONE." "Yes, I did receive my Island! The shipping time was awesome and I am so very happy with the product. Honestly, it has changed how I work in my kitchen so much! It's attractive and versatile and the price was right! I researched this item on the internet quite a bit before I placed the order w/ you and you had the best price by far. It was also really easy to put together. Thank you, thank you! Also, the person who took my order via phone was very pleasant"
"This e-mail is a "thank you" to tell you that I am thrilled with my new kitchen cart. It arrived much sooner than I expected and was packaged very well with no missing pieces. Having shopped around on the internet, I already knew you had the lowest price and now know that you have the best service as well. Your company is helping to give online purchasing a respectful reputation!" "Thank you for this information. Our order arrived very promptly. I would also like to commend your company on the fantastic product that you put out. The kitchen island we ordered for our new home is one of our best purchases yet. Thank you for putting out such a quality product and being so efficient with this order process!" "I just wanted to let you know how easy it was to put these carts together and the quality of the carts is first class My husband and I want to know if there are dealerships available AT any rate. I won't pass up a chance to blow your horn. Thanks so much." "I received my order and just wanted to tell you how very pleased I am with the Oak Kitchen Cart. I had it together in 2.5 hours and it is so much more than I ever thought it would be. Your products are so much more than your descriptions. I never even thought it would be this high quality. I just wanted to tell you and your company what fine kitchen items you have and would highly recommend them to everyone I know. Thank you again for your great service and wonderful quality products." "I want to thank you, my butcher block is exactly what I had expected is beautiful thank for the quick way you processed my order. P S. I think the person who took my order was Kevin, thank you again." I must tell you, I was running through my folder of purchased items and saw this invoice. It jogged my memory to write to you and tell you how pleased we are with the kitchen cart. It has been such a help in my small kitchen. It holds a lot of stuff, stuff that I use frequently, and it's sturdy, pretty and very nice. Thanks for the wonderful quality!" "Hi, Just to let you know that the cart came on time, is beautiful, I love it tho it took a while to put together. I would highly recommend your company to anyone asked." "Stainless & Butcher Block cart - was received BEFORE promised (happy surprise! ), was in perfect condition because of outstanding care in packaging, went together exactly according to clear & accurate instructions and is just what I wanted. A very good-looking, functional addition to my kitchen - AND it almost coordinates well with my oak cupboards! I appreciated the prompt service on my order and timely email updates; outstanding service and a good product. Thank you." "Just letting you know that I received the part that was missing from my cart. 'Thank you for the excellent service." "We received our kitchen island last Friday and we gotta tell you - it's gorgeous! We are so happy with this product we had to write and tell you so. Besides the fabulous red color, the workmanship and solid wood construction, the beautiful stainless top and all the hardware as well as the generous storage all add up to an exceptional piece of furniture. Each piece was wrapped individually and carefully to avoid scratches and dents. "We received our kitchen cart and just wanted to let you know that we are very please with the merchandise. All parts were there, instructions clear and easy, and it looks beautiful in our kitchen. Hoping to do business with you again soon. thanks again ..."
"The cart we purchased from your company exceeded our expectations. It is very well made and was easy to assemble." "I wanted to tell you how pleased we are with the kitchen island. It's better than we expected. Amazing quality and not even one screw missing. Everything went together perfectly. Took us 2 hours from start to finish with a few breaks. Excellent service, excellent product. We couldn't be any happier. Plus, we got the deal of the century. I received my kitchen island and just wanted to express to you, and your company that the island is made of excellent quality and very easy to assemble. I am very pleased with the product and will let anyone know about the quality in your products in the future." "We purchased the large buffet and hutch and my husband put it together. It had all the parts & it is beautiful. It is everythign that I hoped it would be. I am very pleased. Great price too. Thanks for offering good quality produts at a reasonable price." "Thank you for the quick delivery. The unit is of great quality for assembled furniture. We were very pleased with that and the fact that it was not difficult to assemble, along with the quick delivery. "Arlene, Thank you very much for your service regarding the processing of my order for the baker's rack. It arrived intact, and on time. I will not hesitate to mention your Company, (and you) to my friends and associates." "I received it, assembled it and love it"
"I ordered a small bakers rack from you a few months ago. I am very satisfied. As a matter of fact, I am so happy with what I ordered, that I just ordered another one today. Your service is great & the quality is fantastic. I looked everywhere in N.Y.C. and could not find what I wanted. You had it. Keep up the great work"
"Thank you for your prompt and efficient order delivery service on this product. We are very satisfied with our new bakers rack." "Thank you so much for your wonderful service. I have a tennant moving in so it really is appreciated. This is the 3rd rack like this, that I have purchased. I rehab homes so I hope to order more in the future." "Received our Powell Bakers Rack on Thursday, 12/15/05. Everything about our order from start to finish went smooth, and the assembly of the Bakers rack was very easy. Great looking piece, and good quality for the money"
"Received this wood rack today-thought you would like to know that my "picky hard to please engineer husband" is impressed with the construction and quality. Thanks"
I love the Magma grill and highly recommend it to anyone who is looking for a powerhouse product with a small footprint. Thanks! "I just wanted to let you know we bought the Artic fire pit from you guys and it is marvelous, just the best, heavy weight, big size and really works for us. You can send anyone to me to give a good review on this product. In fact I have sent the website to my daughter-in-law in Chicago. I wish I would have gotten his before I already sent their Christmas presents, what a great gift this would have made." "I am extremely pleased with it. In fact, I am ordering another." "Thank you for shipping our new Del Mar Grill so quickly! It looks beautiful. Thank you again for your prompt service"
"Just wanted to tell you that I received the refrigerator panel I order. I install it and what a difference it makes. We have a small kitchen and the black side of the refrigerator seamed to take over. the panel is perfect. Thanks for a job well done." "We received the chairs last week. We love them!" I am just writing to thank you. I placed the above referenced order in the beginning of March. I was expecting a 5 week delivery and in less than 4 weeks my order arrived. The kitchen stools I ordered are beautiful and they are better than I expected in quality. I will pass your name on to many as I know and I will always think of your company first when considering any purchases in the future. We received the 2 chairs yesterday and they are exactly what we were looking for. Can't be happier with our purchase. Thanks again. "I receive my order last week. I am very happy with the product (kitchen counter swivel stools). Thank you so much. I will recommend your website to my friends." "I receive my barstools and I absolutely love them!" "I received my three stools. I love them. Thanks"
"The order arrived in good condition Thursday as scheduled. Part is installed, and seems to be working well. Thank you for your quick assistance and follow through." "I like them. Went in easy with no problem." "Your prompt handling of our order has made a great impact on our being able to utilize our kitchen. The stools look great. Thank you again. Looking forward to buying from you in the future. Will tell our friends." "I have just received the bar stools and think they are great." "I am writing to thank you for your super fast service. We received our Holland Bar Stools today - only 10 days after ordering them! They are beautiful! Thanks for the fast, professional service and for a great product." "The entire order was delivered this afternoon. We are pleased with your service, your pricing, and your speed, and for the future we will recommend your company to friends and family. Thanks." "I just wanted to let you know how incredible your customer service is. I called to check this item and spoke to a wonderful rep who told me if I ordered it over the phone with her it would be shipped sooner. I ordered it last Monday night and I have it already. I couldn't be more satisfied." "Thanks for the great service. Received the order and installed over the weekend. Great Products, great delivery time, ok price - all in all I am a very happy e-customer"
"I have received this order and it is great." "Thank you so much for sending my item so quickly. I was surprised how fast I got it. I quickly installed the RevAShelf and it was pretty easy for me. I love it. It works great. I'll order from you again, I'm sure. I appreciate quick service!" Linda C. Phelan on the Rev-A-Shelf Pull-Out Baskets "RV-5WB2-1822-CR"
"We love it... that's why we want another"
""Another on-line satisfied customer. I was looking for a lazy susan on-line, that I needed before Dec. 16th. I searched the internet and found that your company had a two tier lazy susan in stock and it could be delivered within 7-10 days. That would have put delivery just in time. I placed my on-line order here from a small town in Northern Minnesota on Dec. 2nd 2003 and it was delivered by Speedy Delivery on Dec. 4th. I could not believe it. It is installed and in plenty of time before my other appliances arrive. Thank you so much. Excellent service." We have a small kitchen and it (the pull down rack) is wonderful"
"I love it....its out of the way...sleek and clean looks...got a lot of compliments"
"The waste basket just arrived via UPS and it's beautiful. My sister will love it. Dettaree, thank you very much for keeping in touch. I have ordered things several times from other online merchants and never got the stuff after being charged with no reply at all. However I would definitely buy from Kitchen Accessories again. Thanks for all your help." "Cleanly designed. A great step -on can. This can exceeded my expectations. I am very pleased with it." "I ordered replacement Lazy Susan parts for two cabinets in my kitchen. The order arrived so quickly I had to contact my installer and get him on the job! The installer and his partner arrived at 4:30 yesterday afternoon and by 6:00 I had two perfectly functioning lazy susans! They commented about the installation instructions being easy to follow and the ease of adjusting the units in existing cabinets. Wanted you to know how happy I am with not only the quick service but the quality of the parts." "I just wanted to tell you how please I was with your service. As you can see, I ordered the item Wed. afternoon and it arrived on Saturday. The item is just as described, and I am very happy with your service. Thank you very much." "We received the final 23 kitchen knobs today. THANK YOU SO MUCH for your diligent follow up, and for your quality product. I appreciate a company that is so professional. Thanks again." "We received our package on 12/9/03. We are very satisfied. Thank you. We love your website and plan to purchase from you again in the near future." "Received the bullet top trash can today --- I love it! Always wanted one of these things for my kitchen. Tossed the old Rubbermaid out the door - thanks!" "Thanks so much........the "bread box" drawer insert arrived two days ago and it is a perfect fit and TERRIFIC." Marian on the Custom Inserts Breadbox Insert "CI-BB 18"
"I recently ordered and received a spice rack, #CI-SPRA21-8, that works perfectly in a special space. We really like it. Thanks, great product!!!!!" "I LOVE the drawers as does my wife.....hence 3 more! Thanks for such a great product." "I had almost given up on finding a Hafele cabinet handle...and she found it. I ordered 31 and may order 20 more for the bathrooms. Thank You so much! I will recommend your site to my friends." "I wanted to take a moment out of my crazy remodeling schedule to send you a note of appreciation for the wonderful service I have received from KitchenSource.com, in particular from Lettie Brady in Customer Service. Lettie sent me an email this morning to let me know that there was a concern about a dimension I had provided for a custom drawer. This is the kind of thing that could potentially take up a whole day for someone in my position by the time they have to contact the vendor to see what the problem is, then get back to their designer, chase down the cabinet-builder, reconfirm specs, wait for everyone to call back, re-contact the vendor-- on and on it goes. But Lettie was able to discuss the specs with me as if she were a builder herself, then as luck would have it, I reached my cabinet foreman right after I hung up with Lettie and was able to express the concerns about the drawer and to reach a conclusion with him so as to insure the drawer would be correct for the cabinet which it's to be installed into. And as it turns it, Lettie was correct in her suggestion that we make the drawer slightly larger and install undermount glides rather than side-mount glides. And perhaps best of all, her suggestion gives me more room in my custom drawer than I would have had! She added the glides to my order and saved me the time it would take to place the order online myself. Talk about Easy As Pie! Thanks a million to kitchensource and to Lettie for taking off some of the pressure and for saving me the expense of having to order a new drawer after this one arrives, which is probably just exactly what would have happened but for her contacting me and questioning the specs I gave with my order. Looking forward to doing plenty more business with KitchenSource.com within the next few weeks until maybe forever? ha"
"Hello, The cabinet came last week and looks GREAT!!" "The cabinets arrived, have been installed and are... GREAT!!!" "I just wanted to let you know my cabinet arrived on Monday and I put it together last night. Your instructions were user friendly - especially having all of the pieces labeled. it looks great! Thank You." "Just wanted to tell you I just returned home to find my drawer waiting for me. It is so perfect I could attach the rails and slip it right in. I realize my request to accommodate a farm sink might not be unusual, but you were the only ones willing to handle it. No one else could even conceptualize I wanted a drawer rather than two doors. Thank you for working with me and completing my kitchen. " "They are absolutely beautiful...great....I love them"
"Great Fast Service! The Wine Rack I purchased from you was nicer than I expected, and it arrived WAY faster than I would have ever dreamed... and super easy to be assembled! Thanks for the great service"
"The panels for my fridge and dishwasher look great and fit like a glove. I'm really happy." "Really nicely done....I was leery of tape as a method of attaching the trim kit, but this stuff does stick...It's really strong." "It's Exactly what I wanted. Came out perfect. Absolutely Beautiful." "I love, love, love it!!! I finally just tonight got to install my S/S Frameless Panel Kit for my Side by Side Fridge that was badly scratched in the move. I absolutely love it...and so does my husband. He said, "You better let them know about this great product." I am so pleased with your outstanding quality product. I will recommend you every chance I get. " "We had ordered a sink from another vendor and it turned into a nightmare that left us without a kitchen sink and water for almost two weeks. I contacted you to purchase a Wells Sinkware sink, and spoke with Arlene. I asked if there was expedited shipping, and Arlene explained that it was not available, but she would put a "Rush" on the order. (I hadn't even explained our quandry) I ordered the sink on Thursday morning, and it arrived on Friday morning! I cannot thank you enough for your incredible service. The product, by the way, is excellent and we are very happy. Thank you Kitchen Source and a big thank you and kudos to Arlene. She was knowledgeable and helpful and is obviously a great asset to your company. " "Jessica, I can not thank you enough. I actually called Federal Express this morning and they told me that they would NOT deliver even with Kraus's approval! So, I have arranged to pick up the two sinks personally at the holding station over my lunch hour. I can not thank you enough for your excellent customer service and willing to help. I am so excited to get the sinks/faucets! Thanks so much ~ have a great rest of the week. I will certainly use KitchenSource.com again for any future needs." Thank you and hope to do business in the near future." "I ordered a couple of faucets several weeks ago. I have already received them and I am very pleased with the quality"
"Thank you so much. I just received the strainer - great delivery. I know where to order my plumbing supplies next time around." "I wanted to tell you how much I appreciated the help I received from Jesse Bradley who works in customer support. He was professional and courteous and really saved me time and money. That kind of support will make me a return customer. Thanks Jesse. " "I love this device!!!! It fits perfectly and looks great - matches my stainless steel appliances." "Well, I just love my touch-free kitchen garbage can. My friends go to the kitchen and place their hands near to top of the container just to see it open. I think my friends come to see and play with the kitchen garbage disposer and not me!!! I LOVE IT!!" "I received my Touchless Recycle Center yesterday and want to let you know how pleased I am with the quality of this product. I have it set up and working in my kitchen. My thanks to the gentleman who returned my call regarding how to remove the battery cover. If you are able to make changes to the setup instructions, it might be helpful to add that you have to push on the battery cover at the same time you lift it up. Again, so far, I am very pleased with the product and plan to browse your site to see what else appeals to me." "We have never ordered on the internet except for this trashcan my wife wanted. We could not be happier with the can and especially the service from you. You provided the information on shipping so we could track it. Outstanding." "I absolutely love this product. I saw it on HGTV House wares show from McCormick Place in Chicago on a Sunday and was using it on Friday. I love the hands free aspect and the size is perfect for the standard kitchen bags. AND the price is right! " "Great trashcan! Looks good, functional, and the slow-shut top is a nice touch. I am very pleased. Thanks for offering the best deal on the net!" "I just wanted to let you know that I received my order today. Thank you for your excellent, quick service. It was a pleasure to deal with your company." "I have received the AC adapter at no charge from you folks, I believe you handled my concerns extremely well, and I will definitely continue to do business with you in the future. Thank you for your very Professional Customer Service." "This is our 3rd and we love them! Send as fast as possible! Thanks." I received the table leg and have it installed. Looks great!" "The base I bought from you for my table/ countertop is beautiful. everything about it is perfect. couldn't be more happy with it. the materials it is made up of are the best!" No complaints...received my order (Broan Mirrored Medicine Cabinet) very quickly - and in one piece. Because of the rather large, unframed mirror on it, I was apprehensive about having it shipped, and, as it turned out, unnecessarily so. It was very well packed - the manufacturer's box was well designed to protect the product, and the whole thing was packed inside a larger box that was very substantially insulated from damage with bubble wrap and air bags. The only problem I had with the order was the missing shelf brackets that Broan expressed me after I emailed their Customer Service Dept. Needless to say, I am very pleased with KitchenSource and its suppliers. You deserve to be commended. Thanks. Thank you so much for the replacement mirror...we are so impressed with your customer service. The Broan medicine chest is top quality and quite beautiful! Thanks for your diligence and extra special service. I am really impressed with you and with KitchenSource.com. I wish I had found your web site when I was looking for the medicine cabinets. I can see that I would not have made the same mistake. While the sites I visited copied their product information directly from Afina-- complete with the aforementioned flaws-- KitchenSource.com did take the extra measure of explaining that the optional "sides" were needed to surface mount, and the description of the sides on your site does list the surface mount hardware as included. Thanks again. I look forward to receiving my order, and I will remember the great service. I have recently placed 3 orders for Smedbo loft bathroom accessories and are very happy with my purchases. "I appreciate the re-order. I have just completed renovating 2 sets of restrooms. These are so beautiful in the restrooms to compliment the new decor. They are not wall mounted but on the sink counter and tables. Their beauty is bringing lots of compliments." I have a Lowes portable fireplace I love except the interior firewall was far to thin and cracked soon after getting the fireplace. I sent back 4 but I loved the fireplace. It performed well had a pull out drawer that the next day made it a two minute drill to clean and dump the ashes from the previous night. I purchased from you the stainless steel insert ($158) for this 5th fireplace and I think it will permit me to keep this and enjoy this final model for many years to come. Great product so thanks.